After the stupendous success of Komban, Karthi is donning the lead role in a film titled Kashmoro. Nayanthara is pairing with Karthi. Moreover Vivek is donning an important role in the film. 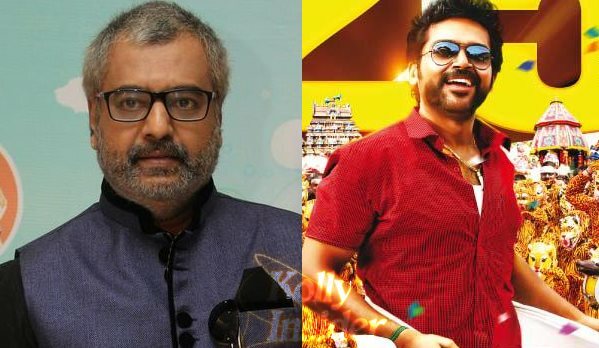 Now at this juncture, there is news that Vivek is donning Karthi’s father role in the film. It was indeed a surprise when Vivek during the audio launch of ‘Palakkad Madhavan’ mentioned that he is sporting this new look of salt and pepper for the sake of his upcoming film ‘Kashmora’, where he plays Karthi’s father. This was kept secret. Vivek had revealed this news during the audio launch. It seems various getups were tried for Vivek to look like Karthi’s father but none of them suited him. Finally Vivek said that he will have salt and pepper look in a couple of days and this would work out. If at all Vivek dons the role of a father, Vivek himself will don the son role as well. This is for the first time he has donned the role of a hero’s father. The shooting of ‘Kaashmora’ commences from first week of May and this is going to be completely different in the career of Karthi as it belongs to horror-fantasy-period and adventure.